An essential component of conducting "Taber wear tests" is the type of abrasive wheel that is used. 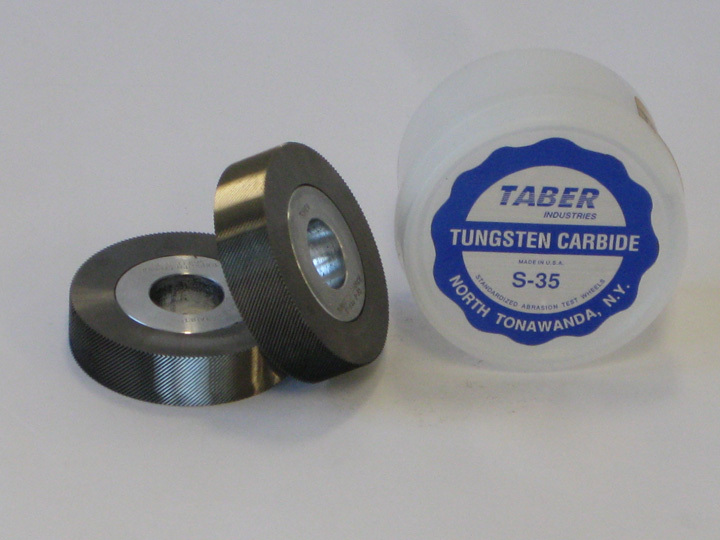 Taber offers standardized grades of Genuine Taber abrasive wheels, engineered for a variety of specific applications. The wheels are a proprietary formulation developed and designed by Taber Industries so the binder material breaks down during use, exposing and creating a new abrading surface. The minimum usable diameter of Taber abrading wheels is 44.4 mm, which corresponds with the wheel label. 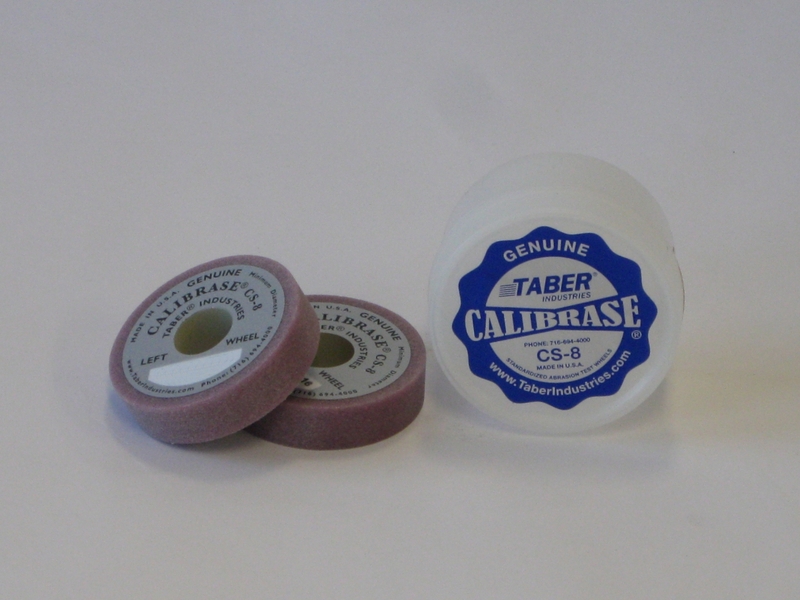 Calibrase® - A resilient wheel composed of resilient binder and aluminum oxide or silicon carbide abrasive particles. Frequently used to evaluate rigid specimens. Calibrade® - A non-resilient wheel composed of a vitrified (clay) binder and silicon carbide or aluminum oxide abrasive particles. Frequently used to evaluate flexible specimens. Specialty - Used for special applications. For both Calibrase and Calibrade wheels, different grades are furnished to meet varying requirements of abrasive action. The composition of Genuine Taber abrading wheels has been carefully chosen to reproduce normal service wear. The quality and uniformity of these wheels is maintained by continuous inspection sampling and tightly controlled manufacturing processes. Wheels are sold in pairs, and shipped in tight-lidded containers to prevent damage. Each wheel is labeled "LEFT HAND (or RIGHT HAND)" to assure that the mounting position will be duplicated after the wheels have been removed and later re-installed. For Calibrase and Calibrade wheels, the label is also used to indicate the minimum diameter of the wheels (1.75 inch or 44.45 mm OD). When the wheel is worn to the label, it must be replaced. Depending on the abradant type and test specimen, the wheel surface may change (i.e. become clogged) due to the transfer of material from the test specimen to the abrading wheel, and must be cleaned at frequent intervals. Click here for information on Refacing Options. As the abrasive coefficient of the wheels can also be altered by oil and other contaminants, handle only the sides of the wheels. How long a set of Genuine Taber Wheels will last is dependent on the load, surface texture and frictional characteristics of the material being tested and frequency of refacing. Load references are per arm. By itself, the abraser arm provides a standard load of 250 gram on the wheel. Using the auxiliary weights, standard wheel loads of 500 or 1000 grams can be obtained. Please note, the markings on the auxiliary weights are NOT reflective of the actual mass of the additional weight. The auxiliary weights are marked with the TOTAL load that will be exerted on the wheel and equals the combined mass of the abraser arm and auxiliary weights. The weight marked 500 gram is actually 250 grams and the weight marked 1000 gram is actually 750 grams. CS-8 Calibrase - A resilient wheel that offers a very mild abrading action, designed to operate under loads of 250 or 500 grams. Reface with the S-11 refacing disc. CS-10F Calibrase - A resilient wheel that offers a mild abrading action, designed to operate under loads of 250 or 500 grams. The CS-10F is typically used to test materials such as safety glazing materials and transparent plastics, and should be refaced with the ST-11 refacing stone. CS-10 Calibrase - This resilient wheel offers a mild - medium abrading action like that of normal handling, cleaning, and polishing. This popular wheel has been used to evaluate a variety of materials including organic coatings, plastics, textiles, leather and paper products. Reface with the S-11 refacing disc. 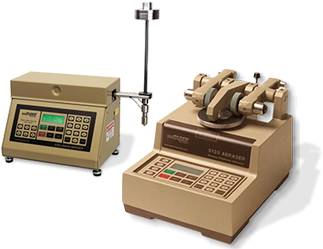 CS-10P Calibrase - The abrasion rate is the same as the CS-10, but this wheel has been engineered so the wheel surface does not load when testing paper products. Intended for tests of short duration (e.g. 100 cycles), with refacing after every tenth test. CS-10W Calibrase - This wheel is the same as the CS-10 but white, to eliminate any color transfer from the wheel to the specimen. CS-17 Calibrase - Compared to the CS-10 wheel, the CS-17 produces a harsher abrasion. Normally operated using loads of 500 or 1000 grams, this wheel is useful for testing materials such as anodized aluminum, powder coatings, ceramics, plastics and enamels. Reface with the S-11 refacing disc. WARNING: Because of possible deterioration, Calibrase wheels should NOT be used after the expiration date printed on the wheel. H-10 Calibrade - A non-resilient, vitrified wheel designed to evaluate steel and ferrous alloys for resistance to abrasion. It has also been used to test the effect of hardening and tempering treatment on steel and other ferrous materials. 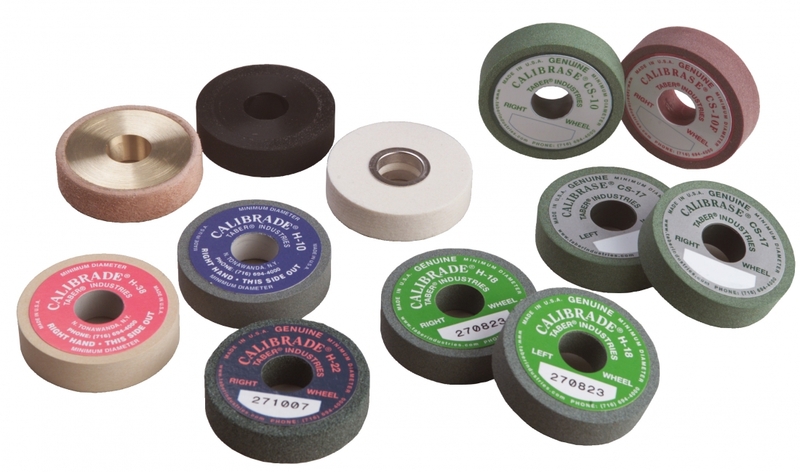 H-18 Calibrade - This commonly used non-resilient wheel provides a medium coarse abrasive action. It is most often used to evaluate resilient materials such as rubber (non-tacky), certain woven textile fabrics, coated fabrics, and flexible plastic sheets. H-22 Calibrade - The H-22 wheel produces a coarse abrasion. It has been used to test rubber, linoleum, leather, deep pile fabrics (such as automobile floor coverings) and concrete. H-38 Calibrade - A non-resilient, vitrified abrading wheel comprised of fine abrasive particles. Designed to operate with 250 or 500 gram loads, the principal use of this wheel is to test woven and non-woven fabrics. Must be refaced using the Taber Wheel Refacer and multi-point diamond tool. NOTE: Calibrade wheels do not have an expiration period. 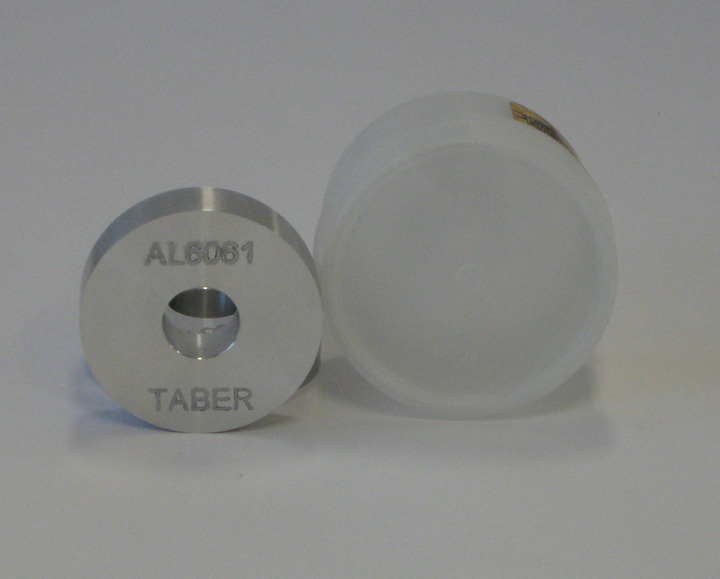 Custom Formulations - To inquire about custom wheel formulations, please contact Taber Industries. CS-0 Rubber (same as S-32) - A resilient wheel containing no abrasive particles. Intended for use when a very mild abrasive action is required, or for wet tests such as determining the relative abrasion of dental pastes, cleaning powders, or similar compounds. Adhesive sandpaper strips can be adhered to the periphery of the CS-0 wheel to evaluate the abrasion resistance of high-pressure decorative laminates and other products. CS-0 wheels have an expiration and should not be used after the date printed on the label. CS-5 Felt - This abrading wheel is manufactured from a densely compacted wool felt. Designed to be tested with 250 or 500-gram loads, its principal use is in testing textile fabrics when the service wear requires one fibrous material to rub against another. S-35 Tungsten Carbide - Manufactured out of tungsten carbide, the periphery of the S-35 consists of sharp helical teeth (1 mm pitch x 45° spiral pitch angle). The teeth combine both a cutting and tearing action, which provides a very severe abrasion. Intended for use only on resilient materials such as rubber, linoleum, and leather. S-35 wheels may be cleaned using a soft brass bristle brush. S-39 Leather - This wheel is used in conjunction with the Grit Feeder to conduct three-body abrasion tests, and includes a leather strip that has been adhered to the exterior of a brass hub. Aluminum Wheel - A solid aluminum wheel that can be used by itself or to apply an abrasive strip. S-33 Sandpaper Strip - A closed coat sandpaper that is cut to 12.7 x 160mm strips and includes a pressure sensitive adhesive to attach the strip to the periphery of CS-0 (S-32) resilient wheels. The S-33 consists of an extra fine aluminum oxide grit, graded as 360 FEPA which has an average particle size that is approximately 40.5µm (0.00159 inches). The paper is an "A" weight which satisfies the paper grammage requirement of 70 - 100 g/m². To maintain the rate of abrasion, the sandpaper strips must be changed after a defined number of test cycles (typically 200 or 500). Applications include vitreous and porcelain enamels, paints, metallic coatings, and furniture surfaces. S-42 Sandpaper Strip - An open coat sandpaper that is cut to 12.7 x 160 mm strips and includes a pressure sensitive adhesive to attach the strip to the periphery of CS-0 (S-32) resilient wheels. The S-42 consists of a very fine aluminum oxide grit, graded as 180 ANSI-CAMI which has an average particle size that is approximately 78µm (0.00304 inches). The paper is an "A" weight which satisfies the paper grammage requirement of 70 - 100 g/m². To maintain the rate of abrasion, the sandpaper strips must be changed after a defined number of test cycles (typically 200 or 500). Applications include high pressure decorative laminates, wood flooring, plastics, furniture surfaces, paints and varnishes. WARNING: Because of possible deterioration and influence on abrasion rates, S-42 sandpaper strips should be stored in a temperature and humidity controlled environment. 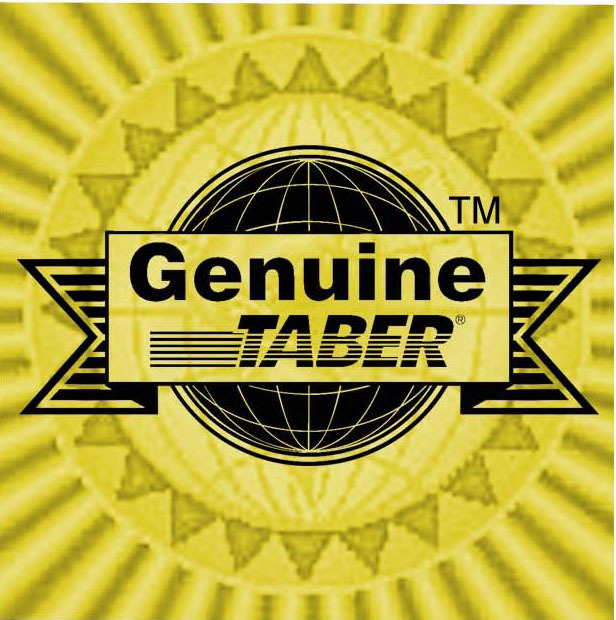 Click here for additional information on Genuine Taber Wheel Information. 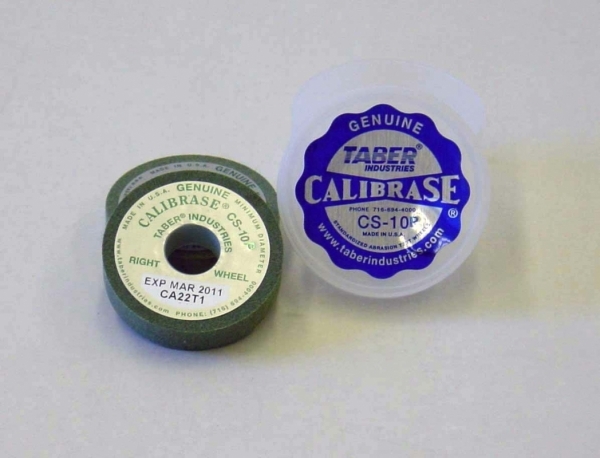 IMPORTANT NOTICE: For results that you can trust, always use Genuine Taber Products. 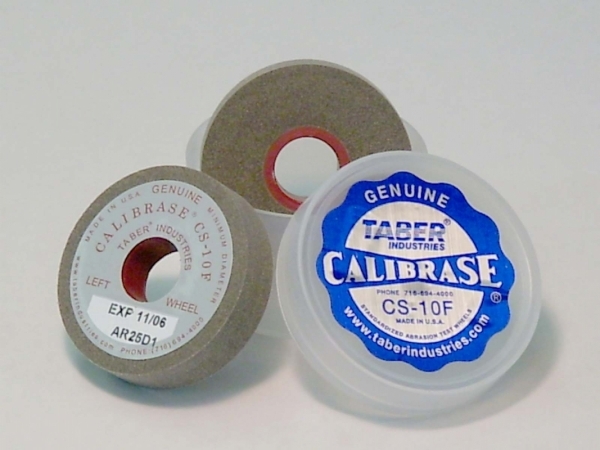 All Genuine Taber Abrading Wheels and Wearasers include a security label on the packaging to identify them as Genuine Taber.